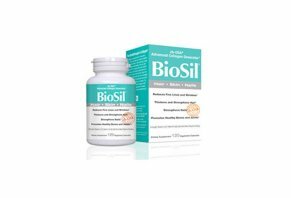 BioSil Reviews - Is It Legit? Endorsed by Christie Brinkley, BioSil is a brand of supplements that promise to help you address fine lines & wrinkles, achieve luxury looking hair, and great looking nails. We take a look at the scientific claims and ingredients to see if this products works. Endorsed by ageless 64-year-old supermodel Christie Brinkley, BioSil is a supplement that can reduce fine lines and wrinkles, increase skin elasticity, improve overall hair health and strengthen nails. The BioSil products include capsules for the hair, skin and nails; as well as liquid drops for bones and joints. Both products contain BioSil’s patented ch-OSA®. This stands for choline-stabilized OrthoSilicic Acid, and is BioSil’s clinically proven complex that turns on the fibroblasts in skin and osteoblasts in bone that generate collagen. According to Dr. Michael Murray, who is considered one of the world's leading authorities on natural medicine, BioSil has been shown to improve the health of the skin, hair, nails and bone and may also show benefit in improving joint health, cardiovascular health – and even brain health. Simply put, BioSil works “by increasing the production of collagen throughout the body,” Dr. Murray explained in an educational video on his website about BioSil. Collagen, which comes from the Greek word for glue, is the “support matrix of our body” – in other words, the tissue that holds it all together, he noted. “So collagen content is very important to the health of many, many tissues,” Dr. Murray emphasized. BioSil has been shown to increase the collagen content of the skin, he said, which leads to “healthier skin” by diminishing fine lines and wrinkles, and increasing skin elasticity. “It also increases the strength and thickness of hair; increases the strength in our nails; and has a phenomenal effect in increasing the collagen content of our bone,” Dr. Murray said. He further explained that the quality of our bone is largely determined by the quality of collagen content. Ch-OSA is a bio-available form of silicon which was found to increase the hydroxyproline (a major component of the protein collagen) concentration in the dermis of animals, according to a study on the “Effect of oral intake of choline-stabilized orthosilicic acid on skin, nails and hair in women with photo-damaged skin” published by the National Institutes of Health. The effect of ch-OSA on skin, nails and hair was investigated in a randomized, double blind, placebo-controlled study that involved 50 females with photo-damaged facial skin, who were administered orally during 20 weeks in the form of ch-OSA pellets or a placebo. The study noted that Silicon (Si) was suggested to have an important function in the formation and maintenance of connective tissue. Results showed that the serum Si concentration was “significantly higher” after a 20-week supplementation in subjects with ch-OSA compared to the placebo group. Additionally, skin roughness parameters increased in the placebo group, but decreased in the ch-OSA group. The study ultimately noted that the oral intake of ch-OSA for 20 weeks resulted in “a significant positive effect” on the skin surface and skin mechanical properties, as well as on brittleness of hair and nails. The study noted that Silicon has already been associated with bone mineralization, collagen synthesis, skin, hair and nails health atherosclerosis, Alzheimer disease, immune system enhancement, and with some other disorders or pharmacological effects. According to the company’s website, results in the BioSil clinical trials are considered “statistically significant, which means that the obtained results have come from the compound tested. “This reduces any possibility of chance to a great extent,” the company noted. These results were based on healthy female participants – in their 40s, 50s and 60s – who showed signs of wrinkles, sagging skin, and loss of skin elasticity caused by decreased collagen, a degraded collagen “mesh” and degraded elastin. For hair, the female participants ranged between 18 and 65 years old who all showed signs of weak, thinning, dull hair. Are there Side Effects to Taking BioSil? According to the company’s website, no, and this answer is based on numerous scientific clinical trials – as well as the fact that hundreds of thousands of people are currently taking BioSil. The company states that instead of side effects occurring, users of BioSil will experience the “side benefits” of a smoother skin complexion and reduced wrinkles, as well as thicker, stronger hair and healthier bones. In a study published by the European Food Safety Authority, the Scientific Panel on Food Additives and Nutrient Sources added to Food was asked to provide a scientific opinion on the safety of ch-OSA added for nutritional purposes as a source of silicon in food supplements and on the bioavailability of silicon from this source. The opinion dealt only with the safety of ch-OSA as source of silicon and with the bioavailability of silicon from this source. If you’re taking the liquid BioSil for the skin, hair and nails, the company recommends taking 5 drops, twice per day, which can be mixed with a quarter cup of fluid, preferably juice, and should be consumed immediately. If you’re taking the capsules, the recommended use is one capsule twice a day. Those who are taking BioSil for the bones should consume 6 drops once a day in fluid, preferably juice. If you’re taking capsules, take one twice a day. As far as the best time to take BioSil is concerned, the company states that the drop dose can be taken at any time if the dose is only once a day. If you’re taking more – like 2 capsules daily – take half in the morning and the other half in the evening. On Amazon, BioSil received 4.1 out of 5 stars based on 1,204 customer reviews. Both the BioSil liquid and BioSil capsules can be purchased online at a number of local retailers. For the most part, the prices are similar everywhere it’s sold. Amazon: A bottle of 120 capsules costs $50.39; and a bottle containing 30 capsules costs $15.99. A one-ounce bottle of the liquid drops costs $25.59. iHerb: A bottle of 120 capsules costs $50.39; 60 capsules cost $28.79 and 30 capsules cost $15.99. A one-ounce bottle of the liquid drops costs $25.59. GNC: A bottle of 60 capsules costs $29.99. Pharmaca: A bottle of 30 capsules costs $15.99; 60 capsules cost $28.79; and 120 capsules cost $50.39. A one-ounce bottle of the liquid drops costs $25.59. As far as aesthetic beauty is concerned, Christie Brinkley is considered one of the greatest beauties of our time. She is particularly known for her photo shoots in the late 1970s, when she graced the pages of Sports Illustrated Swimsuit issues. She also spent 25 years as the beautiful face for the CoverGirl cosmetic line, and has been on the cover of more than 500 magazines. In other accolades, she was named as one of the “most attractive women of all time” by Allure and Men’s Health magazines. Today, at age 64, she is still working as a model and actress, as well as a business woman. And looking at her today, it’s hard to believe her timeless beauty, as pictures speak louder than words. Christie Brinkley is the main spokesperson for BioSil, and she states on the company’s website that she’s never endorsed a beauty supplement before. She further went on to say that she now understands the real important of re-gaining lost collagen and protecting her existing collagen from breakdown. It’s hard to ignore the fact that one of the most beautiful women of all time, Christie Brinkley, shows virtually no signs of aging in her 60s; and while she obviously has taken great care of herself over the years with a healthy diet and exercise, she also attributes her beauty to taking BioSil. For the most part, reviews from customers about BioSil are positive – with the negative reviews coming from customers who claim they got headaches while taking the product. There are several scientific studies backing the efficacy of BioSil, including studies posted on the company’s website. For these clinical trial protocols, researchers used the same protocol that the U.S. government requires the pharmaceutical companies to use – which ensures accuracy and repeatable results. Additionally, independent studies on ch-OSA, which is the magic ingredient in BioSil, showed that ch-OSA was found to increase a major component of the protein collagen. All these factors combined make BioSil seem like a legitimate product to improve signs of aging, including wrinkles, sagging skin, and loss of skin elasticity caused by decreased collagen. It’s important to keep in mind that this review is not intended as medical advice. Before you start taking the BioSil capsules or liquid drops, talk to your medical provider, first. Write a Review for BioSil!